Yuma is a large community of over 84,000 people nestled in the Gila Valley in the southwest corner of Arizona. Surrounding communities like Gadsden, San Luis, Somerton, Blaisdell and Dome bring the Yuma County population to over 170,000. Yuma is currently the third fastest growing city in the US. "Snow Birds" double the area population in the winter months, adding an estimated $300 million annually to the local economy. Yuma describes their weather as "temperate" but summer temperatures get quite high and stay high for about three months. The remainder of the year the weather is quite pleasant, with average daytime temperatures in the 60's. According to the Guiness Book of World Records, Yuma is the sunniest place on earth. The sun shines approximately 90% of the daylight time. The Yuma office of the Bureau of Reclamation recently partnered with the Yuma Quartermaster Depot (formerly Yuma Crossing State Park), the Imperial National Wildlife Refuge and the U. S. Fish and Wildlife Service to introduce three endangered Colorado River fish to Yumans. 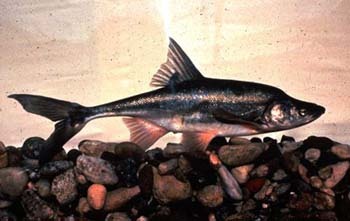 These fish - the Bonytail Chub, Arizona Razorback Sucker and Desert Pupfish - are on display in aquariums at the Yuma Quartermaster Depot State Park. Interactive displays discuss the history of the Lower Colorado Basin and the origins of the fish. Due to the impact of large dams, the introduction of non-native sport fishes and other developments, native populations of these fish have declined drastically. Today a multi-agency cooperative effort is underway to sustain and expand the dwindling populations. More discussion of re-introduction efforts at the Bill Williams National Wildlife Refuge is in the next chapter. The Bureau of Reclamation requests that if anyone catches one of these fish, it be immediately placed back in the water and report the catch to the nearest ranger. Yuma is the home of the Yuma Territorial Prison and Yuma Crossing State Historical Sites (now called the Yuma Quartermaster Depot), the Marine Corps Air Station, and the Yuma Proving Grounds. The city has 23 city parks, 2 city-run golf courses, 12 pedestrian, equestrian and bike trails totaling over 14 miles, and the Yuma West Wetlands. The major east/west thoroughfare is Interstate 8, and U. S. Highway 95 is the major south/north route. Agriculture, tourism and the military are the top three economic factors in Yuma. The city and county are named after the original inhabitants, the Yuma Indians. The Quechan, Cocopah and Mohave Indian Tribes were combined into the Yuma, their being in the same linguistic group. The Colorado River, and adjacent Mittry and Martinez Lakes dominate recreational activities. The Sanguinetti House Museum preserves and exhibits many artifacts of the Colorado River Region. The Sanguinetti House was constructed in the 1870's, and was purchased in 1890 by pioneer merchant E. F. Sanguinetti. He added to the home as his family grew and created an Italian oasis with a garden and bird aviaries, which are maintained today. The house contains exhibits and period rooms, which tell the history of the lower Colorado River region from the 1540's to the present. Next door is the Adobe Annex. Constructed in 1873, it was the home of steamboat captain Jack Mellon. Today it houses the Rio Colorado Division (RCD) Library and Archives collection, as well as a Gift Shop. Two doors away is the Molina Block, constructed in 1875 as a business building. It is currently undergoing rehabilitation to serve as a future museum site for the RCD. Exhibits in different rooms provide the visitor with a brief view of area history from the 1540's to the early 1900's. The Reception Room orients people via a three-dimensional map of Arizona showing historical trails, towns, and topography. The Time Line Room provides 3 exhibits detailing the growth of the area: "The Mountain Men" exhibit discusses the advance of trappers in the 1820's; "The Fort Yuma" exhibit deals with the establishment of a military post to protect people passing through the Yuma Crossing; "The Time Line" tells the story of Yuma's growth and development between 1842 and 1916. The Parlor exhibits encompass the original 2 room 1870 adobe portion of the house. "The South Room" has furnishings that are typical of a middle class home between 1870 and 1890. "The North Room" is indicative of the same type of family between 1900 and 1915. The Economic Activity Room has 5 exhibits: "Steamboats" brought people and supplies to Fort Yuma in the 1850's and plied the Colorado River through 1915; "The Railroad" arrived in Yuma in 1877 and was the first competition the steamboats had, as freight was less expensive by railroad; "The Military" has been represented in the area from the Spanish through the present; "Mining" describes the variety of minerals and extraction methods in the area; "Agriculture" became a booming industry once government projects diverted the Colorado River waters to the fertile land. The Museum is located at 240 Madison Avenue. Museum hours are 10 AM to 4 PM Tuesday through Saturday (except holidays). Admission is $2.00 for 12-18 year-olds, $3.00 for 19-59 year-olds, and $2.00 for 60+ year-olds. Children under 12 admitted free. The Quechan Indian Museum is located at Fort Yuma. Exhibits depicting the original Yumans are on display. An impressive array of retired military vehicles is displayed at the Wahner E. Brooks Historical (Military) Exhibit on Imperial Dam Road. The Yuma area and river crossing were part of a major Native-American trade route. An ongoing battle for control of the crossing began when Spanish explorers tried to claim it after their arrival in the area. Juan Bautista de Anza and Padre Francisco Garces made several expeditions using the crossing during the 1770's. Garces founded two missions at the crossing in 1779, but they were destroyed and Garces was killed in the last major Indian uprising a few years later. The Quechan Indians, descendents of the Paytans, controlled the crossing for the next 70 years. During the Gold Rush in the mid-1800's, San Diego County extended from the Pacific Coast all the way to the Colorado River. The ¼ mile-wide junction of the Colorado and Gila Rivers became a key focal point and gateway for prospectors rushing westward. Thousands of immigrants swarmed across the Sonora Desert and forded the river here. In 1850, an America-born physician named Able Lincoln saw another kind of gold here. Mustered out of the Mexican-American war in 1848, Lincoln was headed back to his home in New York State from Mexico City when he veered west when he heard of the gold strikes in California. When he got to Yuma, he became convinced that a ferry business across the river could be as good as gold. Lincoln built a boat and began ferrying immigrants across the river in January, 1850. He charged $1 per man, $2 for a horse or mule, $1 for the pack, 50 cents for a pack and saddle, and 25 cents for a saddle. In an April 1850 letter to his parents, Lincoln boasted that he had transported more than 20,000 immigrants and cleared over $60,000 dollars. Unknown to Lincoln's parents, an interloper had begun to usurp ferry operations from Lincoln. John Joel Glanton was also a Mexican-American war veteran, but after the war Glanton embarked on far different and deadly pursuits. Glanton and a gang of bounty hunters tracked down and killed many Apache Indians in the borderlands. The bounty was the scalp, for which they were paid $200 each by the governor of Chihuahua, Mexico. Glanton and his gang arrived in Yuma only a few weeks after Lincoln had started his ferry business. Glanton began muscling in on Lincoln's business, and soon had full control. The price of crossing soon rose to $10 per head and more, often paid while looking down a gun barrel. Glanton also preyed on the immigrants, robbing and terrorizing them. Glanton also feuded with two other crossing operations downstream, one run by an Irishman and the other by the Quechan Indians. The Irishman was soon dispatched, but the Indian Chief named Caballo en Pelo wanted to work out a deal. He offered to give up ferrying people and only swim animals across the river. But Glanton would have none of it, and booted the Indians out of camp. Insulted, the Indian Chief vowed to kill every white man at the crossing. Lying in ambush on April 21st 1850, en Pelo descended on Glanton, Lincoln and nine others while they slept in the noonday sun and clubbed them all to death. News of the massacre infuriated many Californians. Under the command of General J. C. Morehead, more than 100 members of the California State Militia, an armed voluntary force, were recruited to defend the area and the crossing. The "Gila Expedition" ended unceremoniously. The Indians had since quieted down, but to justify the expedition Morehead provoked them, killing 20 and burning their crops. Declaring victory, the militia returned home. The deadly incidents at the crossing made it clear that the area needed to be secured and made safe, and prompted the introduction of the U. S. Army. In November of 1850 U. S. Army troops built an Army post called Camp Yuma at the crossing and built Fort Yuma on the California side. Camp Yuma lasted a little over a year, after all attempts to transport supplies failed. The failure included the grounding of a big steamer called the "Invincible." Camp Yuma was abandoned in 1851, but a small force stayed to defend the ferry area. The site was renamed Camp Independence. After the establishment of steamboat navigation of the river, Yuma Crossing was used by the Army to store and distribute supplies to other military posts as far away as Nevada and Texas. A six-month supply of food, clothing, ammunition and other goods was maintained at all times. The site became known as Yuma Crossing, and later as the Yuma Quartermaster Depot. The Southern Pacific Railroad came to Yuma in 1877, signaling the beginning of the end of the Depot. After the Depot's equipment was moved to Fort Lowell in Tucson, the Depot was terminated in 1883. The Signal Corps had established a telegraph and weather station at the Depot in 1875, and used the site until 1891 when they were replaced by the National Weather Service. In 1908 the U. S. Customs Service acquired some of the quarters at the Depot, and used them for housing until 1955. The site became part of the Arizona State Park System in 1976. The name was officially changed to the Yuma Quartermaster Depot by the Yuma County Board of Supervisors effective May 2007. The Yuma Territory was under the flags of Spain and Mexico until 1854, when it became a territorial possession of the U.S. under the Gadsden Purchase. For four years starting in 1854 Yuma was known as Colorado City. In 1858 the name was changed to Arizona City, and it received its present name in 1873 by the Territorial Legislature. In 1858 Joseph Snively from Texas found gold dust 18 miles north of Fort Yuma. The find sparked a California-style gold rush, and a settlement known as Gila City emerged. About 1,000 prospectors soon converged on the site, and the town became a hub of gold mining activity. But the strike didn't last long. The settlement soon vanished, and Gila City became a ghost town. In 1858 Arizona City was home for about 1,200 residents, and was the principal military supply depot for the troops in Southern Arizona. There were several large mercantile houses in town, along with a wagon and several blacksmith shops, and a weekly newspaper called the Arizona Free Press. It was a prosperous business place. In 1862 a major flood destroyed almost all of Arizona City. So much water breached the banks of the Gila River that water 20 feet deep covered a ranch in the low lands to the north of town. This event proved to be a precursor for other destructive floods, causing partial or full reconstruction each time. In 1863 Arizona was organized as a territory, and by 1867 Yuma became well established. Permanent homes began replacing the mud huts. The first post office opened its doors in 1866. The rich soil by the river produced ample crops, and commerce flowed from Mexico and California. Wagon factories were established to serve overland freighters. The Yuma Territorial Prison was established in 1876. During its 33-year existence a total of 3,069 prisoners, convicted of sundry crimes ranging from polygamy to murder with grand larceny being the most common, were housed within the rock and adobe cells. The first prisoners were accepted on July 1st 1876, and had to build their own cells. The structure had three-foot thick granite walls, and iron gratings protected any openings. The prison has long had a history of stories depicting the presence of spirits within its walls. The "Dark Cell", with no windows, was most often associated with the spirits. There are claims that two prisoners who spent time in the dark cell went insane and had to be transported to a mental asylum in Phoenix. Other odd happenings included lights turning themselves on and off, and cash register money suddenly taking flight, and then returning to the drawer. In 1900 twelve new cells were dug into the hillside to alleviate overcrowding. By 1907 severe overcrowding and lack of expansion area were the impetus for the construction of a new prison in Florence, and the last prisoner left the Yuma Territorial Prison in 1909. From 1909 until 1914 the Yuma Union High School occupied the building. Later on, the empty cells became a temporary refuge for hobos hitching rides on the railroad, and for refugees from the Great Depression. Despite its infamous reputation, the prison was a model institution for its time. On Sunday after church service, public bazaars were held where the prisoners sold their handcrafted wares. Many prisoners first learned how to read and write at the prison schoolhouse, and they all had access to good medical care and a hospital. By all accounts, the prison was administered most humanely. In 1911 the first aircraft landed in Yuma. The Wright Model B biplane had an automotive motor, weighed 800 pounds, and was piloted by Robert G. Fowler. On September 11th 1911 William Randolph Hearst had offered a $50,000 prize to the first pilot to fly from the Pacific to the Atlantic Coast within 30 days. Fowler, Harry Atwood and Cal Rogers were the only pilots willing to attempt the flight. Fowler began his flight from Golden Gate Park in San Francisco on September 11th 1911. It took 45 days to reach Yuma, with stops at Auburn, Sacramento and other now-unknown locations. Hearst never paid the prize money, Atwood having dropped out of the running before the race started, and Fowler and Rogers failing to make the 30-day limit. Yuma was incorporated as a city in 1914. Many older buildings cluster around a few city blocks bounded by 1st Avenue, Giss Parkway, Main Street and South Gila Street. Some are vacant, and others house an eclectic mix of small businesses. Further west along First Street you will see many turn-of-the-century homes, hotels and vacant buildings. In 1928 640 acres of land near Yuma were leased from Yuma County for $1 per year, and Fly Field was born. Named for Colonel Benjamin F. Fly, the airstrip was used sporadically by private aircraft until 1941, when the US government bought it. An airbase was constructed in 1943, and the Yuma Army Air Base began graduating pilots. Flight activity decreased after the war, and the site was partially reclaimed by the desert. In 1951 the Air Force reactivated the base, and renamed it the Vincent Air Force Base. The facility was signed over to the Navy in 1959, and in 1962 the designation was changed to the Marine Corps Air Station. During World War II the Army operated a camp near Yuma. The US military needed a place to develop and test bridging equipment to support military operations in the Pacific and European theaters. The nearby Imperial Dam offered an opportunity to change the flow of the river, from a raging torrent to a trickle. The Army opened the Yuma Test Branch in 1943. Tactical bridge testing was not the only project at the Branch. Rice and hemp fields were planted on the river for the purpose of testing vehicle movement through rice paddies. The Test branch closed in 1946, only to re-open in 1951 as the Yuma Proving Grounds. Today nearly 1,700 military and civilian employees continue testing of aircraft armament systems, automotive-tank equipment and other experimental systems. After the war Yuma began losing population due to the closing of the military bases. In 1949 a group of Yuma Jaycees discussed ways to pump life into the community, and came up with an idea. The old Yuma airfield was no longer in use, and they thought it could be used to establish a world record of in-flight time. The goal was to stay in the air for 1,010 hours, which would beat the record of 1,008. The project became one of the most important events in 20th century Yuma. A coalition of community members contributed to the project. A company named A.  A. Amusement had a new airplane, the Aeronca, which they were willing to loan to the project. It was christened the "City of Yuma." Two aircraft mechanics volunteered to keep the plane running. Bob Woodhouse and Woody Jongeward, both Yuma businessmen and ex-Navy pilots, volunteered to be the pilots. A businessman offered fuel, a doctor offered his services to maintain the health of the pilots, and the Valley Café offered meals that were delivered by law enforcement officers. Word got out of the attempt at the world record, and soon every newspaper and radio station was covering the stunt. People throughout the nation viewed newsreels of it between movies at their local theater. The plane took off in September 1949 and began circling Yuma. Refueling the plane was a feat in itself. A car loaded with 3-gallon milk cans of fuel would "taxi" down the runway. The plane would approach, reduce speed and fly in concert with the car under a wing. Whichever pilot was not at the controls would grab the milk cans from the passenger in the car and refuel the plane. An estimated 13,000 Yumans were on hand when the plane finally landed on October 10th 1949. It had stayed in the air for 1,124 hours. It was airborne for 47 days and flew 89,920 miles, the equivalent of 3 ½ times around the world. Worldwide publicity of the event led to the re-opening of the airbase, which became the Marine Corps Air Station in 1959. Today the plane is displayed at the Welcome Center on the west side of 4th Street, one of the first things seen in Yuma when approaching from California. Yuma County is the home of a rare plant called Yuma lettuce (Stephanomeria schotii). The plant was thought to be extinct until it was rediscovered in the Cabeza Prieta Game Range in 1978, 100 years after its last sighting. It was later found in Pinta Sands, Mohawk Dunes and the San Cristobal Valley. While the numbers and range of the plant are severely restricted, it currently has no protection status with the EPA. Other plants on the "Species of Concern" list that occur in Yuma or Yuma County include Dune Spurge, Gander's Cryptantha and Dune Sunflower. The Yuma Lettuce Days are an annual event that celebrates the bountiful impact of agriculture in the surrounding area. The event features produce displays, an Iron Chef cooking contest, agricultural machinery, the Red Hat vegetable hat contest, music, food and other entertainment. The event is usually celebrated in January in Yuma's Old Town and other locations within the city. Yuma hosts several arts and crafts festivals during the year, including a Christmas Arts and Crafts festival, the Old Town Jubilee Arts and Crafts festival, and the Yuma Crossing River Daze Arts and Crafts festival. The Yuma Bluegrass in the Park festival is a 1-day musicfest featuring nationally known bluegrass bands. Ballet Yuma hosts several "Nutcracker" cultural festivals during the year, featuring plays like "Death by Chocolate" and "The Nutcracker." Yuma lies within the Basin and Range geologic province, typically characterized by large, plain-like valleys and basins interspersed with numerous mountain ranges. Within the last million years, alpine glaciers that covered the high mountains of Colorado, Utah and Wyoming melted, depositing large amounts of sediment along the Colorado River and shaping the current land forms. The mesas and terraces around the Gila River are remnants of an extensive valley and delta plain. Elevations in Yuma County range from 108 feet above sea level at the Somerton Siding to 2,942 feet at Kofa Butte. The area surrounding Yuma is known as the Yuma Desert, a lower-elevation section of the Sonoran Desert. The Yuma Desert includes the lower elevation sections of southwestern Arizona, extending to the Colorado River. On the other side of the river in California is the low desert region of the Sonoran Desert, often called the Colorado Desert. 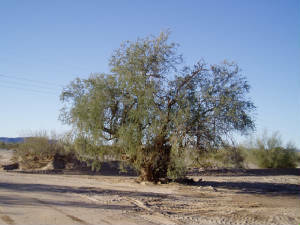 Vegetation around Yuma is dominated by Creosote. Large, columnar Saguaro cacti are common on the bajadas, as well as Ocotillo, Palo Verde, Desert Willow, and Desert Ironwood. Many people don't associate trees with a desert. But many trees make their home here, including Palo Verde, Desert Willow and Desert Ironwood. The Desert Ironwood (Olneya tesota) grows in washes and valleys of the Sonoran Desert below 2,500 feet elevation. Desert Ironwood is in the Pea family and its flowers resemble Sweet Pea flowers. It can grow as tall as 30 feet and live to be 1,500 years old. Its wood is very heavy (it doesn't float) and strikingly beautiful when prepared properly. The tree creates its own habitat when fully grown, and plays a very important role in the survival of over 500 desert animals and plants. The temperature beneath the canopy can be 15 degrees cooler than the surrounding temperature. The leaves and seed pods are eaten by many animals. Insects thrive in the canopy, attracting a host of birds. The Desert Willow is known as a "nurse plant", providing a safe place for seed germination and protection from frost. Many wild flowers grow under the Desert Ironwood, which are in turn eaten by jack rabbits, Desert Bighorn, mule deer and desert tortoise. Saguaro, organ pipe, night-blooming cereus and other cacti are protected from browsing when growing amongst the thorny branches. The Open Space and Recreational Resources Element is part of the Yuma County 2010 Comprehensive Plan. There are a total of 1,054,285 acres of land in and around Yuma that are defined as Open Space and Recreational Resources. Yuma County takes its recreational activities very seriously. Most of the activity is centered on the river, where water sports, fishing and wildlife viewing prevail. Day trips into Mexico to shop and dine are very popular. The Yuma Parks and Recreation department offers kayak and canoe trips along the Colorado River. They provide all transportation, life jackets, equipment, instructions and tour guides. Private trips can be arranged for a fee ($16 per person for a canoe and $19 per person for a kayak), with a minimum number of eight people required. "Open" trips are also available. The excursion begins as soon as a minimum of eight people sign up. Up to 26 people can participate in an open trip. Participants are transported from West Wetlands Park to an area known as "Backwater 33", a put-in near the confluence of the Colorado and Gila Rivers. Participants are given instructions and provided with life jackets, and your glide downriver begins. It takes about three hours to float back to West Wetlands Park. The ride is very basic and excellent for canoe or kayak beginners, there being no whitewater along the way. You can take a train ride in Yuma aboard the "Jersey Lil", a 1922 Pullman coach featured in the Movie "The Life and Times of Judge Roy Bean." The Yuma Valley Railway offers two-hour tours on Sundays at 1 PM October through December, and Saturdays and Sundays January through March. Pulling out from Old Town Yuma, the tour takes you along a river route and through West Wetlands Park, the only National Heritage Area west of the Mississippi. An on-board historian relates local historical facts and folklore. Call the Yuma County Live Steamers at 928-783-3456 for more info. West Wetlands Park is a 135-acre city-operated recreation and wildlife preserve along the river south of the 4th Avenue Bridge. Six interconnecting trails and loops totaling 4 miles can be hiked year-round. Fishing, boating, horseback riding, restrooms, water, shaded areas and grills are also offered with no fees. Burrowing owls are becoming rare in the southwest, but are common here. 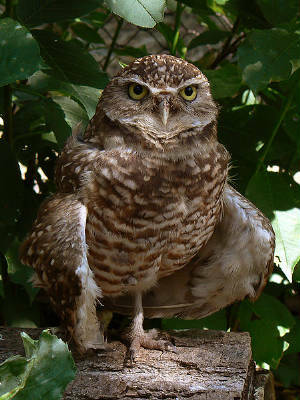 The Burrowing Owl (Athene cunicularia) is one of only 11 bird species being afforded protection by an international environmental agreement between the United States, Canada and Mexico. It is unique among owls in that it nests in underground burrows that it usurps from ground squirrels or other burrowing animals. It is fairly active in the daytime, and it used to be fairly common to see them standing guard outside their burrows. Their diet consists of insects, mice, frogs and some birds, doves in particular. The West Wetlands Park has 30 artificial habitats in use and more being constructed all the time, which attract the owls. Over 80,000 trees have been planted by volunteers at the park, which also offers canoe, kayak and nature classes. The Wetlands are divided into two distinct areas, an active area where recreation takes place, and a passive area where conservation takes place. For more information on the Wetlands please visit their web site at www.ci.yuma.az.us/parksandrec. The Muggins Mountains Wilderness Area is about 20 miles northeast of Yuma just south of the Yuma Proving Grounds. 7,711 acres were set aside as wilderness by the U. S. Congress in 1990 and the area is managed by the BLM. The cluster of rugged peaks and colorful geologic strata are a wonderful place for a solitary hike. The prominent summit is Muggins Peak at 1,424 feet. It and two other peaks are dissected by Twin Tanks and Long Mountain washes. You may encounter day hikers, back packers or rock climbers, but chances are you'll have the entire area to yourself. A 5-mile loop hike to Muggins Peak is recommended only for hikers with good route-finding skills. The hike is described at www.azcentral.com/travel/hiking/articles/muggins03.html. An information kiosk is located at the end of a primitive road off of County 7th Street. The Mittry Lake Wildlife Area offers a variety of habitats, from open water to marshes and wetlands to desert upland. Recent rehabilitation work includes dredging, revegetation and fish habitat restoration. A 3-lane boat launch ramp connects numerous waterways to the lake body, making for a pleasant boating experience. Small-game hunting and fishing is available. There are no camping facilities or designated camping areas, but the lake offers 10-day self-contained camping. No fewer than 90 entries are included in Yuma's RV and Mobile Homes list, giving testament to the emphasis on winter tourism. You are sure to find accommodations for your RV in any size/price range. Many of the RV parks have overnight rates for the "drive-through" camper. The Hidden Shores Village RV Park is north of Yuma at the Imperial Dam. 575 full hook-up RV sites include some view and beach-front lots, with daily, weekly or monthly rental rates. The park offers RV and boat storage, has a 20,000 square foot clubhouse with all amenities, and a convenience store. Dogs with "aggressive behavior" are prohibited. The website is http://www.hiddenshores.com/. The listed address is 10300 Imperial Dam Road, and the listed phone number is 928-539-6700. Their E-Mail address is info@hiddenshores.com. The Blue Sky RV Park offers 276 spacious sites with full hookups and 30 or 50 amp service, free cable TV, telephone, Wi-Fi and extra wide double slide-out sites. Pets are allowed, but there are some restrictions. Rates range from $238 to $396 per month, depending on the size of the RV. Their web site is http://www.blueskyyuma.com/, and their phone number is 877-367-5220. More E-Mail information is available at manager@blueskyyuma.com. Golfers will love the Cocopah RV and Golf Resort on Strand Avenue. Of the 805 full hook-up spaces, 135 of them are on the golf course. Tucked away in a rural northwest corner of Yuma right along the river, the resort offers a host of activities and amenities. A convenience store is available, and the Cocopah Grill serves up breakfast and lunch specialties. Sites for pets are available. Their web site is http://www.cocopahrv.com/, and their phone number is 928-343-9300. Reservation and rate information is available via E-Mail at info@cocopahrv.com. Residents of Yuma just can't seem to find room to store everything in their homes! So Lute's Casino has become a popular place to permanently store everything from animal heads to street signs to old movie posters. The bar, which isn't a casino at all, has become known for great burgers, an unbeatable pool hall and a hangout for townspeople who love to play dominoes. Yuma is large enough that all of the franchise hotels and restaurants are well represented. Truckers often frequent the Copper Miner's Kitchen on the Fortuna Overpass over I-8. Trucker recommendations are often the most tried and true. The El Pappagallo Mexican restaurant on South Avenue B and the Texas Roadhouse come highly recommended by diners.